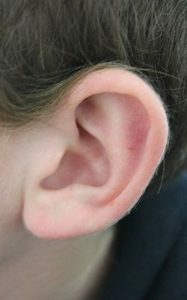 “A woman angry about her food order from a Chinese restaurant allegedly bit part of the owner`s ear off during an altercation. Authorities said Jade Anderson, 24, of Mount Clemens, entered China 1 at about 9:40 p.m. and started complaining to the restaurant`s owners, a man and his wife, about an order she received. Because of a language barrier, the pair`s son translated what Anderson was saying. Who hasn`t verbally chewed a restaurant owner`s ear off after an unpleasant dining experience, but it`s a horse of a different color for a restaurant patron to go full Mike Tyson and bite the owner`s ear off during a vicious fight. Whenever I enter a sketchy Chinese eating establishment I`m well aware that the Sesame chicken might really be dog or rat, but I will never willingly eat a human ear. I`m tempted to call Anderson an animal, but I have too much respect for animals, so I will simply refer to her as a steaming pile of human excrement. Anderson was charged with assault with intent to maim, and she will probably also be charged with child neglect, because she left a small child alone at home. It won`t do this finicky eater any good to complain that there are rat droppings in her bologna sandwich when she`s behind bars.